Technology never ceases to amaze me! I know that nights can get very busy during the school year with homework, dinner and extracurricular activities. I just wanted a place to post all of the internet programs that the students use at school and how you can have access to them at home. Your child does not need to go on these websites at home, but they are a great tool for fun, engaging learning! Kidbiz 3000– Students will use their regular school username and password to access Kidbiz. This website sends out new non-fiction articles for the students to read and answer questions about. Although all of the students get the same basic lesson, the content is differentiated based on your child’s reading level. After reading the article, there are activities for your child to complete that helps improve their comprehension, vocabulary acquisition and writing. If your child would like to read articles from Kidbiz for his/her 10 minute reading time, that is great! Your child can write the name of the article on their reading log for that night. Reading Eggs– Students will use their regular school username and password to access Reading Eggs. This website is a fun, interactive way for your child to practice their reading and comprehension. Once your child completes the Reading Eggs program, they will automatically go to the Reading Express program which has even more challenging skills. Parents can sign up for this website to track your child’s progress in the program at home. Raz Kids– Students will find their username and symbol for this website and then use their regular school password to login. This website gives students access to tons of eBooks. After reading an eBook, there are different activities that students can do. Parents, feel free to sign up to track your child’s progress. To do this, log in as your child and then click the “parents” link in the upper right. After you complete the registration, I will get an email to confirm your subscription. We also use Qwertytown at school. Qwertytown is an online program that teaches students to become better at typing. Students do not have access to this website at home at this time. ST Math– Your child might call this Jiji. Your child will login to this website using his/her picture password. We use the picture passwords Monday, Wednesday and Friday at school so your child should know their password. ST Math is a fun way for students to practice second grade math concepts. This program does not give written directions, the students need to figure out what to do through trial and error. If your child is stuck, feel free to ask them questions to help them figure it out but please refrain from telling them exactly what to do. JiJi starts off easily and then gets more challenging as your child progresses. IXL-Your child will use his/her regular school username and password to login to IXL. Once there, click on “math” at the top. Once you are on the math page, click on the tab for grade 2. Students can practice the math skills we are working on at school on this website. **We are currently working on Level M and B. 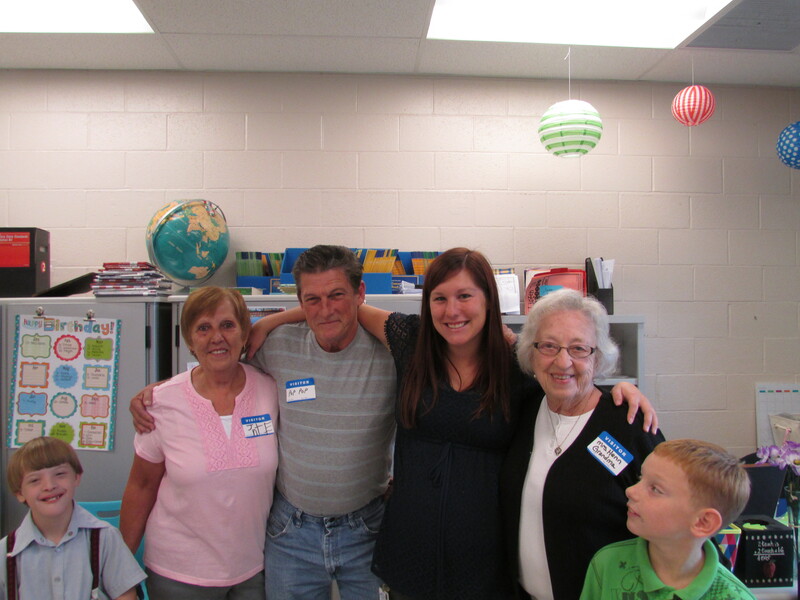 Soon we will be starting on A.
Grandparents’ Day is Sunday, September 13th. Our class would like to celebrate this special day by inviting our grandparents to join us for a special “tea” in the classroom. Last year my grandparents attended our tea too!